Spaces do not render correct previews sometimes for the windows when you look at the spaces from Mission Control (or when you drag a window to the top and wait). 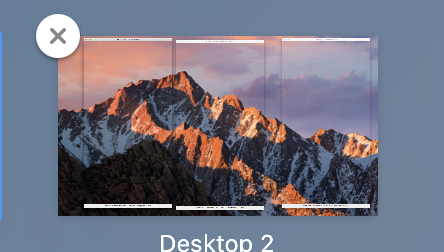 I've also noticed that the "slider" to control two windows (Xcode + Multimarkdown Composer) and (Quicktime + Multimarkdown Composer) can get messed up, but that might be a macOS bug. The split view "grabby" thing rendered on the wrong desktop until I un-fullscreened and re-setup the window again in fullscreen split view. I'm not sure I'm understanding you on this one. Anyway you can send a video showing exactly what happens? Unable to reproduce it again. Maybe it was on High Sierra. Fletcher closed this discussion on 14 Oct, 2018 07:58 PM.